Midfield ace Liam Grimshaw reckons Motherwell’s current crop can do something which has been done just once in the club’s 132-year history. Grimmy (23), back after five weeks out with a groin injury, told the Motherwell Times that he is confident the Steelmen can beat Aberdeen in the William Hill Scottish Cup semi-finals on April 14 to qualify for their second national cup final in the same season. “Being the first Motherwell team to get into two finals in the same season since season 1950-’51 would be great obviously,” said Grimshaw. “It is a huge achievement for a club of Motherwell’s size to reach one final in a season. “Reaching two finals and having a good league campaign would represent a successful season. “Any semi-final is a hard game and Aberdeen will be tough, but we have played them three times this season and have always played well. “I don’t see why we can’t do it again. If Motherwell do win their semi, they will play either Celtic or Rangers in the final, so there is the possibility of a repeat of this season’s Betfred Cup final when the Steelmen were beaten 2-0 by Celtic. “We were well in that final until the second half when Cedric Kipre was sent off when we were 1-0 down and a penalty was given,” Grimshaw said. “It was always going to be tough after that, game over really. 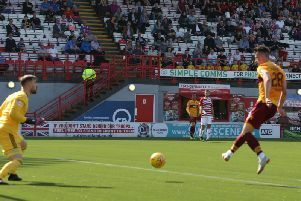 Grimshaw, in his second spell at ’Well having signed a one-year contract last summer, would like to sign a new contract to stay at Fir Park into the next campaign. “I was up here a couple of years ago and got a really good feel for it and nothing has really changed since I came back. The Burnley-born ace is hoping to be involved in the starting 11 for this Saturday’s home Premiership encounter against Rangers, which is live on BT Sport. “You get good exposure up here playing in live games against the Old Firm on telly. Motherwell need a minimum of seven points from three games before the split to have a chance of top six but Grimshaw hasn’t given up on that. “Obviously we can’t control what Hearts do but if we play like we can and pick up good results I don’t see why we can’t be there or thereabouts,” he added.